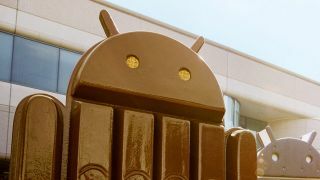 Remember when Google said other devices would get KitKat "in the coming weeks?" Well, the HTC One is definitely not one of those phones. Instead, it will see an update towards the tail-end of January. As in you won't get KitKat until 2014 if you have the best smartphone in the world. Sorry. Android 4.4: when will you get it? It might not be a shock to many, as this was the date given in the wake of the KitKat launch, but these release dates have a habit of shifting, so it's good to see that's not changed. The HTC Twitter account did say you should be getting Sense 5.5 too, and it seems like all HTC One carriers will be included in the update, if that makes you feel any better. We're still waiting to get the full run down on what this will entail, so as soon as HTC sheds some light, we'll be right in touch. You can already find Android 4.4 KitKat on the Moto X if you live in the US but it sure seems to be taking its sweet time arriving on other Android devices, notably other Nexus' beyond the Nexus 5. Despite dragging its feet, the OS update is slowly but surely making the rounds, even reportedly popping up on the Nexus 4 today. Apparently over-the-air updates are heading to the new Nexus 7, original Nexus 7 and Nexus 10 tablets today, too - although it may take a few days for the updates to head to all devices. Factory images from the Google Dev site are available now showing Android 4.4 on pretty much all of these devices, meaning it's only a matter of time until your Nexus-whatever finally gets updated OTA. Don't be glum, chum - the holidays are right around the corner and we've got some gifting ideas for ya!